Situated in Longdon Village, Staffordshire, near Lichfield, Cannock Chase & Rugeley, Longdon Village Hall is an ideal venue for your children's party, celebration, wedding reception, club & much more! LVH has the capacity to hold up to 120 people & offers excellent facilities, including a fully equipped kitchen. If you are looking for a one-off or regular venue, with very reasonable hire rates, for your event, class or club, simply check our booking calendar for availability, then get in touch via our booking form. 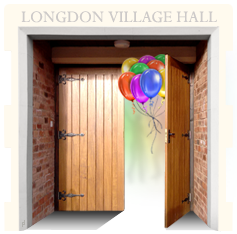 There's always plenty going on at Longdon Village Hall; Check out the hall's regular activities & special events here. Or find the perfect slot for your own event on the London Village Hall booking calendar. We need you! LVH is run by a dedicated team of volunteers. If you would like to help out, please get in touch!